Simple souls that we are, when it comes to overclocking, we prefer instant gratification. With that in mind, the MSI H55-GD65 ought to be right up our alley. The relevant feature here is the OC Genie auto-overclocking button. According to MSI it's a fully automatic, smart overclocking feature that detects the best possible settings. Simply flick the button and enjoy optimal overclocked performance. It even works with the system running, so there's no need to reboot it. But that's just the beginning of the GD65's talents. 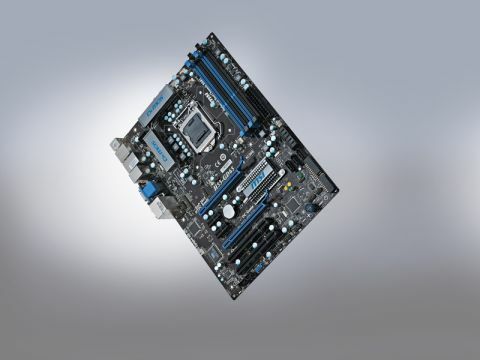 It's a full-featured ATX board at a reasonable price and comes complete with a pair of x16 PCI-e ports for multi-graphics mayhem, though currently support is limited to AMD's CrossFire; SLI hasn't been licensed. Sticking with the graphics theme, this board packs Intel's H55 chipset and that means it's ready to tango with the new Clarkdale fusion CPU and its on-chip graphics core. Thus, you'll find a trio of video-out options among the main bank of ports: namely VGA, DVI and HDMI. Put it altogether with reasonable pricing and the work MSI says it's done to ensure clean power to the CPU and you have what looks like a pretty solid package. The reality, however, is a little underwhelming. For starters, OC Genie thinks that all Core i5-750 chips should run at 3.2GHz. We say "appears", because we can't be sure that result is typical. But it's what's widely reported by users and it's exactly what we found. Not terrible, then, but not exactly 'smart'. However, it's when you get your hands dirty with some manual base clock massaging that more serious shortcomings emerge. Allowing the GD65 to set voltages, timings and the memory clock automatically, a base clock of 185MHz is the best you can expect. That's significantly down on the 200MHz achieved by the best on test.